The 70th anniversary of Joseph Stalin’s forcible deportation of more than 230,000 Crimean Tatars from their homeland in Crimea weighs especially on our minds today. The suffering caused by this mass expulsion is almost inexpressible. Those who survived the horrific transit to Central Asia, the Urals and Siberia faced hunger, disease and repression on arrival. Nearly half of those deported, mostly women and children, perished between 1944 and 1947. Many Crimean Tatars and their descendants remain in exile today. For many Crimean Tatars, these abuses are still fresh in their minds and Russia’s occupation and illegal attempt to annex Crimea has reopened old wounds. The list of human rights abuses committed today in Crimea is long and grows longer with each passing week. Murder, beatings, and the kidnapping of Crimean Tatars and others have become standard fare. 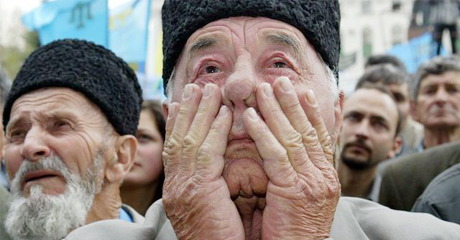 Local “authorities” announced that Crimean Tatars will have to vacate their property and give up their land. Crimean Tatars have been assaulted for speaking their language, and Tatar community leader Mustafa Dzhemilev has been banned from returning to his home in Crimea for five years. Thousands of Tatars and others have fled their homes in Crimea, fearful for their safety. Those who remain face a future of repression, discrimination, censorship, limits on freedom of peaceful assembly and association, and the criminalization of dissent. We commemorate the tragedy of 1944 with heavy hearts, even as we stand in solidarity with Crimean Tatars today against a new threat to their community. We reaffirm our support for Ukraine’s sovereignty and territorial integrity, and our deep commitment to the human rights of all citizens of Ukraine, including those in Crimea.